Less than a week after Apple activated a quality program to replace defective USB-C charging cables, owners of potentially affected units on Tuesday are taking receipt of redesigned model. 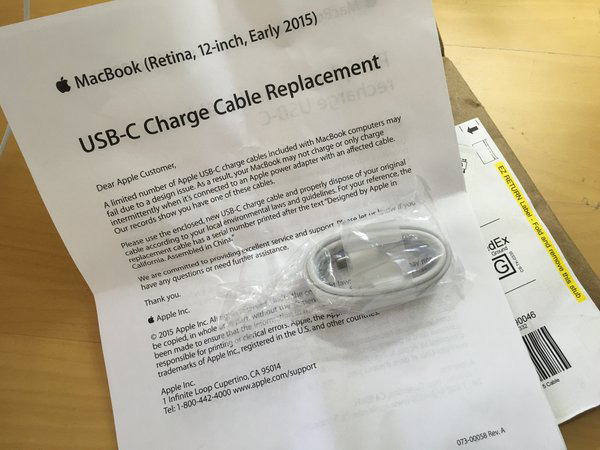 As promised, Apple is proactively sending out free replacement USB-C cables to 12-inch Retina MacBook owners who submitted a mailing address when they purchased or registered their laptop. The quality program announced last Friday applies to a "limited number" of USB-C charging cables sent out with the latest Retina MacBook model, as well as those sold as standalone accessories. An apparent design flaw was discovered that in some cases results in laptop charging failures, or intermittent functionality, when connected to a power source. A note provided along with the replacement cable explains the issue and requests users discard the affected component. Some owners who posted the note online were unaware that Apple had enacted a quality control initiative. Apple says defective units can be identified by looking at markings printed on the USB-C cable sheathing. Redesigned units include a serial number next to printed text reading, "Designed by Apple in California. Assembled in China." while original versions susceptible to failure do not. The company initially said replacements would arrive by the end of February.